So, having linked to a story about their wine tasting room's opening and being a big fan of The Bowery (owned by the same peeps and just up the street), I went to try Delancey out for myself on Thursday evening with a few lovely friends. You know who you are, M., B. & P.
I want to start out by acknowledge something that, I think, as a born and bred New Yorker who lives in LA, I'm in a semi-unique position to say: sometimes LA has a major inferiority complex when it comes to NYC. And, as much as I love my hometown and appreciate a good nod to the Big Apple, I think the obsession occasionally borders on sad. So, maybe there is a fantastic reason why everything at Delancey is named for L.E.S. (The Lower East Side), but it feels a little . . . like it's trying to hard. I mean, they already own Bowery, so the NYC worshipping seems plentiful enough. (P. grew up with me on the Upper West and B. was a longtime New Yorker and they agreed–so there). Okay, that said I really liked Delancey's vibe. I dig the intimacy of the space, the exposed brick walls, the shiny, reflective exposed brick facade, wine-colored booths and the beers choices scrawled casually across an over-sized mirror. Even more than Bowery with its much slicker black and white tiled motif, Delancey does feel like a neighborhood spot (and for a moment I wish I lived deeper into Hollywood). And food-wise things were good. First of all, the menu, like Bowery's, is really reasonably priced. 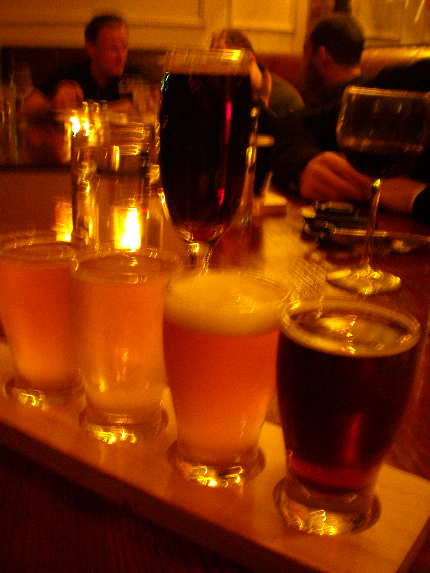 The beer menu (and the flights they offer, which you can customize or, like M. did, you can have created specially for you based on preference) is substantial and I had a glass of sparkling red, which I just LOVE all the time, though I don't think it was a Lambrusco. (Lambrusco is an Italian sparkling wine that's sort of considered low class, but I'm just a sucker for it, as it feels festive to drink like a winter-appropriate summer cocktail). Whose bruschetta this is, I think I know, his house is in the village though . . . Sorry. 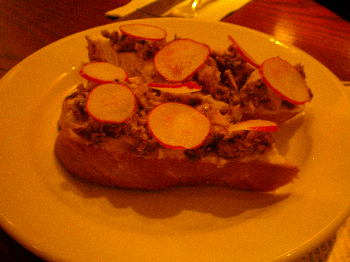 The above White Bean Crostini Bruschetta with Olive Tapenade (one of my favorite condiments/foods in ever invented), Oil Cured Tuna and Radish was ultimately my favorite part of the meal, as it was amazingly flavorful. I sort of envisioned coming back another day with friends and just ordering a bunch of bruschettas and some wine because they have like six options, including a Prosciutto, Goat Cheese & Dates situation–sign me up. I don't know about you people, but live by a "more options to nibble the better" picking rule. Also, for my fellow lactards: the Essex pizza with Salumi, Olives and Cannelini Beans also has Sheep's Milk Ricotta in the mix and was very tasty (though the crust has a specific olive oil doused sort of crunchy consistency that some of us liked and some of us disliked). I'd probably still take Terroni or Mozza's crust over this. 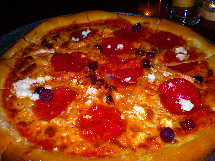 Maybe Pizzeria Ortica too. But none of them offer me a Sheep Cheese version. Anyway, I liked it enough so that I almost murdered Andrew when he gobbled my leftovers without asking yesterday. Grrrrrr. Tip: don't get between this girl and her food cause she might bite. 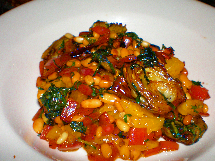 I'd also like to give a shout out to all the Crispy Baby Artichoke hoes with Chili, Sweet & Sour Onions, Mint, Pine Nuts and Orange (I'm crazy), though I think they might have been elevated even further with a bit more acid and/or heat (do I sound Top Chef-esque?). Actually, they were so beautifully colored that I'd order them just for a cheerful addition. And, according to B., the Gnocchi with Wild Boar, Sage and Olives, was a yummy choice too. All and all, though there wasn't a pickle monger or yenta in sight, I'd definitely cross town for Delancey again. (Get it? Crossing Delancey? Sorry–I tried to stop myself from making the reference, but I just couldn't).